Interviewer: You’ve got almost 10,000 flying hours. That’s a lot of hours. Potter: Yes, but the airline pilots now make a career out of it, so a lot of them will have a lot more hours than that. But that’s quite a few for the military. I: You were involved in the Berlin Airlift. Did you have a feeling for what the pyramid builders must have felt when you did that? P: (Laughs) Well, no. I guess I wasn’t that smart back then. The Berlin Airlift was such an all-consuming deal. It ran 24 hours a day, and you could spend as much time working on it as you could. No, I didn’t compare it to anything like that. It was just a big job that had to be done. I: What did you do? P: I was a group supply officer. That meant, if they needed a new starter for the airplane, for instance, or if they needed a tire or something like that, it was my job to make sure that it was expedited from the supply depot. P: Yes, I was a pilot—a regular pilot. So after I got those chores done, then I would go fly. And if someone was sick, I’d fly, too. We had three crews that were assigned to each airplane. And that’s all they did was fly. Supply was my primary job, but flying was secondary. I: What was the C-54 like? P: It was a four-engine airplane called “The Skymaster”. It was the largest cargo-bearing airplane at that time that we had. The British had the Lancaster and a couple of others. I: Any unusual things you flew into Berlin—or that seemed unusual at the time? P: Different bases flew different things. Ours primarily was coal. But, I remember one time, we took in a load of cigarettes. I don’t know how many cases—there were 48 cartons to a case. Another time we took in wine—supposedly for the French. Other than that it was almost entirely coal. The Frankfurt group flew in the flour. I: Did you have to fight a lot of coal dust? P: No, you didn’t notice it, but it was in the airplane. It would sift down into the floor and get into the cables and the pulleys. That’s why every two hundred hours, they’d put the plane in a depot-type maintenance and have it all cleaned up. I: Just how immense was the Berlin Airlift? P: It started in June, 1948 and it officially ended in September of 1949, although technically it ended in May. They lifted the blockade in May, but we kept on flying from May through September. We flew in over one million seven hundred tons of food, machinery and supplies. I: What was the approach to landing? P: There were buildings on both sides, and you’d come in, and the buildings would be higher than you are, and of course, there was a cemetery in there. I: Was the cemetery ominous? Was it scary? P: To some it was. I: There were harassment incidents by the Russians? P: Yes, there were seven hundred thirty-three incidents. You’d pop out of the clouds and there was a Russian fighter just off your wing tip. You could see the pilot. We’d wave and he’d wave back. I: What constituted an incident? P: Like search lights, ground fire, ground explosions, rockets, balloons. I: Were you ever frightened when you popped out of the clouds and saw a Russian fighter? P: I don’t think we were frightened. I think we were surprised, because they weren’t supposed to be there. You always wondered if he’s flying in the clouds like you. Then, he could fly into you. I: There were several corridors to get in and out, weren’t there? P: There were three corridors established when the Allies divided up Germany; and we were ushered into Berlin through these three air corridors. I believe they were twenty miles wide, each. They all terminated in the Berlin area. And, at that time, Templehof was the primary airport; although Tegel was another airport that was built. It was built in the French sector, and they built that in 92 days. The reason they named it Tegel was that it was in the Tegel forest. Germany is divided into sectors, and Berlin was divided into these sectors. So, we had these three corridors that came in, one from the northern area, one in the center and one from the south. We would fly in from the north and the south, and return in the center one. That way you weren’t facing traffic. You’d come in, and as long as your radio was working, it wasn’t any problem because they would have radios set up; and you came over the radio and you turned to a different heading. Whenever you came in and made your approach, if because of weather or whatever, you couldn’t land, you just had to pull up and get back in the stream and go home. You couldn’t go around because you’d interfere with somebody else. I: How could they coordinate all these planes? P: The bases were allowed block times. You see, our base would be, say, 8:15 a.m. to 10:22 a.m., and we would take off at certain intervals. You were assigned 500’ separations—5,000’, 5,500’, 6,000’, 6,500’, 7,000’, and then you’d start back at 5,000’. And then, when we hit 10:22, (whatever our last block time was), then we couldn’t launch any airplanes. Then another base would launch airplanes. We couldn’t launch airplanes until our block time came around again. I: What were the runways like? P: The runways at Templehof were what we call PSP—pierced steel planking. This was used throughout the war at many of the runways in the Pacific. It was steel planks about fifteen inches wide and about eight feet long; and they had slide hooks on each side, so you could put one up against another and slide it into position, and it would lock itself. So you’d have them laid out like that. But they would rattle as you ran over them. I: Would it shake you a lot? P: Oh, some. Not nearly as smooth as landing on concrete or blacktop. There was so much vibration, it would shake them apart. And when it would shake them apart, the Germans would come out after a landing and maybe drive a spike in it, or take some wire and wire it together. The Germans helped on the lift in that they did a lot of maintenance work. It’s been said, we could not have done this without the German mechanics. They had a bunch of the Luftwaffe mechanics that were doing maintenance work on our airplanes, as well as, things like the runways. I: Where were you when the Berlin Airlift started? P: I was in Japan when the Airlift started. I had just come back from a trip to Okinawa. I parked the airplane about three or four in the afternoon on a Thursday, and some of those maintenance men said, “Go home and pack your stuff. We just have a couple of days’ notice to get ready and leave.” We left our wives in Japan, and they stayed there while we were in Germany. I: Do you remember what went through you mind when someone said, “You’re going to supply a city of over 2 million with everything it needs for survival”? P: It almost seemed like trying to dip the lake dry with a bucket. But once you got there, and got to seeing it, you could see that stream of airplanes coming in there; there’s another one, here are five of them halfway down. You could count six or seven planes, just at one time, all in the process of landing. And here are fifteen or twenty landing, and are already being unloaded, etc. I: There was this guy over there known as “the candy bomber”? P: That was Lieutenant Halvorson. It was his idea. The way he tells it, he met some German kids on the street, and one day he gave them a stick of gum. They were so hungry for sweets that they even licked the paper wrapper that the gum was wrapped in, and they divided the gum among two or three of them. And that struck him as being unusual and kind of pathetic—that the kids of that age just didn’t know what sweets were. But he thought that was a kind of shame, so he told some of them that he would drop them some candy. So he started it on his own. He bought the candy himself and made the parachutes out of what he could get. When it became known, his immediate commander told him, “You shouldn’t have done this without me knowing it.” But the generals thought: “What a great public relations thing this is. Instead of dropping bombs, you are dropping candy”. I: I read Berlin Diary, which chronicles life in Berlin before and during the war; and they went through bombing there for a long, long time. P: Yes, these kids were used to hearing or associating airplane noise with bombs, because that’s all they had known. They grew up during the war, and they associated airplane noise with bombs. And then when this happened, they heard the airplanes and no bombs—that was hard for them to understand. And, to drop candy out of it for them was almost more than they could comprehend. I: What was your favorite plane to fly? You’ve flown all of the big bombers, haven’t you? P: Yes. If I had to say a favorite, I’d say the B-52. The jet-flying, for many reasons, is by far the least complicated. It’s much faster—things happen faster, you go faster. The jet engines are much more simple than the engines we’d have, like, on the B-36; where you had the superchargers—the high superchargers, the low superchargers and, of course, mixture controls, and anti-icing controls and all of this stuff that was required on them. For example, with a B-36, you’d come back to base at 20,000’ and it would take you an hour to get to the ground. Before you could retard the engines and start down, you had to go from high blower, to low blower, to no blower. You had to put the carburetor heat on, and you had to go to auto rich, and all of these things which you had to do in the proper sequence. And then, the airplane was limited in the speed of descent that you could take, anyway. So, it would take you an hour to get on the ground. But with a B-52, we could come back at 35,000’, just pull the throttles to idle and down you came. Our standard rate of descent was 4,000 feet a minute. And you had to run three checklists from the time you started down to the time you touched down; so you were busy. And it was fast, and it was fun. I: There weren’t that many people that flew B-52s, were there? P: No, there weren’t that many of them. I: You flew B-29s. Did you like them? P: Oh, it was a good airplane, but it was quite a bit slower and a prop job. And, it wasn’t as reliable. We left Guam one time and I think I was number five to take off. And it wound up that I was the only one that made it all the way home. For various reasons, the others dropped off here or there. I: How could you tell an engine problem from a gauge problem? P: You would have oil pressure, oil temperature, cylinder head temperature, cylinder head pressure and other engine gauges. But the reason you needed so many of them was that if you lost the oil pressure gauge, you could still determine the ability of the engine to keep running by some of the other gauges. If you lost your oil, you knew the engine was going to get hot. So, if you lost your oil pressure, but the temperature gauge stayed down where it should be, you knew you were all right. In the B-52s, you had many fewer instruments. I: What was the B-25 like? P: It was a two-engine model, and it was noisy. It was the only one that I’m aware of that did not have, what we call, a ‘collector ring’ on the exhaust. It was just like a motorcycle. The exhaust exited from each cylinder, and it was extremely noisy. Most of the time, they run a collector ring, and collect all the exhaust and exhaust it on the outside, away from you; so it’s much less noisy. After you’d come home from flying for six or eight hours, you couldn’t hear anything for a day or two. (Laughs) Of course, back in those days, we weren’t so cognizant of the fact that loud sounds cause loss of hearing. We didn’t even use the earplugs. And you didn’t use helmets or anything like that. You just had a headset, and we’d usually put it over the ear that was next to the engine and leave the other off, so that we could talk. In the B-52 now, you wear the helmet where it’s impossible to talk almost, so you talk everything over the radio—through the interphone to one another. I: What were the flying conditions generally like in the Berlin Airlift? P: A lot of fog; a lot of rain. We had some snow. I don’t think we had over two inches of snow, so snow was no problem. You’ve heard of London fog. Well, you have it all over Europe like that. The fog did shut it down a few times. I’ve seen the fog so bad, you couldn’t see ten feet in front of you. When it got that bad, it did close down—at least from our base. But usually, they could run from one of the other bases. I: What was the layout of the Templehof Airport? P: Templehof was right in the middle of the city and the main building is a big crescent-shaped building. It must have been six or seven hundred feet from one end to the other. And of course, the building itself has about seven levels. It was a Messerschmidt factory during the war and when the Russians liberated Berlin. Eisenhower let the Russians do that because of the losses they suffered at Stalingrad, now Leningrad. So, the Russians took over, and they would not let the Allies come in. They took over in April or May 1945. They would not let the Allies come in until, I think it was, August of 1945. During that time, they completely stripped the city—every generator and all of the machines they shipped back to Russia. During this time, they flooded the lower levels of Templehof, the Messerschmidt factory part of the airport. After we got in there then, they started to pump it out, but for some reason or another, they only pumped out one or two levels; so there are still three or four of the very bottom levels flooded, I’m told. I’m also told that there are some Messerschmidts—they started out on the bottom and by the time they got them up to the top, they were ready to fly—so there’s Messerschmidts in the process of being built down on these three or four floors down below. We had two runways and you could land and just taxi into this ramp. They had this great overhang. Sometimes you’d be under this overhang, sometimes you wouldn’t, but you’d taxi right up to this main central building. We parked nose to tail just around this crescent until we got worked way back, and they’d bring you back up to the front. As you got in near your parking place, the engineer with you would open the door on the left-hand side; and before we ever got out of the cockpit, they would have a truck backed up and the Germans would be on board, tossing off the bags of coal. Gosh, they would unload you in six or eight minutes. It was fast. I: How many people would be unloading? P: There must have been ten to fifteen on each truck. I know it surprised me. They didn’t run around in circles. One guy didn’t grab a bag and run back over here and say, “Excuse me”. They set up a chain line and then, after unloading, they sent in a couple of women sweepers and they’d sweep it out. There usually would be a half-bucket or sack—sometimes even more coal that had been spilled. So instead of carrying it back home, they would sweep it out and onto their truck. As soon as we landed, we’d get out of the airplane, and at first, you had to go into the office to get your clearance back. Then General Tunner, who was in charge, changed that. We would have the weather briefing truck—a jeep—and the clearance officer would come out to the airplane. So almost immediately, you’d have the two briefing officers there, and they would tell you, “The weather’s the same going home”, or whatever weather word they’d have, and the other guy would sign your clearance for the way back. The maintenance people would also be there, if we had any problems. If it was something they could fix, then fine. If it wasn’t, then you went on home. You always tried to go home with whatever the trouble was. If it was a light out or something like that, they didn’t worry about that. And by the time you got that done, the Germans would be done unloading. So you’d jump back in and take off. Then they started bringing a little snack bar truck around. It had hot dogs, hamburgers, coke, coffee, cigarettes. You ate while you were getting your clearance. I’m sure your time on the ground wouldn’t average fifteen minutes. And what struck me strange is we had to pay for the hamburgers. (Laughs) In those days, they were probably only a dime. I: What did you think when you saw the Berlin Wall come down? No, it was unbelievable. Because when we were there, we had no idea that it was going to happen. We were hosted by a German couple during our visit. They were in their mid-50s, so that would put them about fifteen, forty years ago. And that was one of the questions they asked, “From our standpoint, did I think the wall was going to come down?” I told them, “Yes.” I thought it would, but I had no idea it would be coming down within a month. I thought in ten years, fifteen years, the people are going to tire of it and just flat not put up with it anymore. I: Air traffic control was revolutionized by the Berlin Airlift, wasn’t it? P: Never before had there been such a concentration of aircraft into such a small area. The bombing raids of Germany during the war were spread out. The airplanes were spread out in formation. And, of course, they didn’t land, so that wasn’t a consideration. But, because of the landing, it required different kinds of spacing, both in time and altitude, to bring you in from seven thousand feet. Because, you see, Berlin is practically at sea level. I think it’s one hundred seventy-four feet elevation—something like that. So to bring you down, they’d step you down. When you hit this particular point, they’d drop you to five thousand; the guy at five, would drop to three, and the guy at three, they put down to one. That had never been done before. There were not that many commercial aircraft flying that required that, even at O’Hare, at that time. I: What was your toughest landing? P: We landed a B-36. I think it was with two engines out, and with some of the hydraulics out. But, I’ve never had any tough landings—nothing that we couldn’t handle. I: Two engines out didn’t scare you? P: And, of course, it depends on how much weight you have. As long as that happens at lighter weights, it’s no big deal. I: Let’s talk about idiosyncrasies of certain planes. Another thing that used to happen in the props—in the B-29 and in the C-54—when you’re flying lower, when you’re in very moist air and relatively warm temperatures, you get St. Elmo’s fire. The B-29 nose is round, you know, and has a lot of metal strips between each of the windows, and the St. Elmo’s fire would just jump from one metal strip to the other. And then I’ve seen it on the props. There’d be a circle of maybe three feet thick, like a pinwheel—completely harmless. You might have it for three or four minutes, and then you pop out of the clouds, get out of the moisture, and it’d be gone. I: Was there much to setting up the airline system in Japan? P: By the time I got there, in mid-1946, we had people all over Japan, Korea, Okinawa, Guam, the Philippines and many of the other smaller islands, like Iwo Jima, etc. The way we had contact with these different places was by our “airlines”. So we had a regular schedule set up. We’d run one trip a week to some of the spots. Others might get a trip a day. I think we ran a daily, plus two or three others, into Korea. We had more people there, requiring more contacts and people movements. Because of the newness of this, we had limited air control, except in the landing field areas. Mostly in route, you were assigned an altitude and you stayed there. There wasn’t enough traffic to cause too big a worry, and we all knew what traffic we had out, that we might see. We always had radio contact with the people in the control towers on the airfield. You’d call them, telling them you would be there at such and such, and they’d give you the landing weather, etc. This would give them a few minutes to clear the runways, in case there was work going on, etc. It was a very primitive system compared to today, but many airfields would only have two or three landings a day. Those where training went on were a bit more busy, but very light compared to today. I: What’s the oldest plane you’ve flown? P: The C-46 was probably the oldest; or the C-47—the old “Gooney Bird”. I: Was it ever hard to switch from one type of plane to another? P: I think this is more true when you go from fighter aircraft to a heavy aircraft. See, I was in heavies all the time. And I have flown little airplanes, like the Cessnas and the Pipers. I flew them, but I never really enjoyed them. I was used to at least two engines, or four engines, or something like that. It’s an entirely different type of flying. I: It was hard for you to fly the lighter ones and feel comfortable? P: Yes, it was. I belonged to the aerial club for several years. You could rent an airplane and go flying for a couple of hours. I took the kids up and, I guess, June up, but I never flew enough to really feel comfortable in smaller planes. You see, in the really big airplanes, everything is systems. You have to know the hydraulic system, so in case a gear doesn’t come down, you have to know how to get around that system and get your gear down. You have to know you fuel system because you have several tanks. You have to burn your fuel so your center of gravity stays within the limits of the airplane—everything like that. So, everything is systems and you have to understand them. But in the little airplanes, it’s not really that complicated and I never had any schooling on the little ones. I: Wasn’t it the ride, too? P: Yes, I suppose so. The smaller airplanes, you usually fly lower altitudes and it’s bumpier. I: What’s it like flying the big planes you flew? P: With the big bombers, when you’re heavy, if you got into the cumulus-type clouds that had quite an updraft in them, you could feel it; you’d sit there and bounce. But for the most part, it’s very steady. But now the jets, you fly high enough that you’re above the clouds—most of them—so it’s just like sitting right here. The only thing that you’re fairly cognizant of is the wind going by the airplane because, you see, you’re flying almost .8 mach in these jets and you can hear the wind and all the pressurization inside. Like in the 747, they pressurize the aircraft. If they’re flying at say 40,000’, cabin pressure is at 7, 000’. They do that by compressing air, by pumping more air into it so it feels like they are blowing up a balloon. You can hear that rushing of the air all the time. I: Any resentment about setting up the airlines in Japan? P: Well, that’s the thing that surprised me. I got into Japan just shortly after the war, and it surprised me that the people there accepted us as readily as they did; because I thought there would be a certain amount of hard feelings, but I saw hardly any of it. The Emperor told them that they’d been beaten and that the Americans were going to be here, and they had better treat them nice. And they did. I: Did you have a most memorable flight? P: I was going to fly a C-46 to Okinawa. So we went down and got to Operations about daylight, as we were supposed to. When I went to the airplane to make sure that it was loaded the way you wanted it; the stuff was tied down, etc. (The pilot would do that before he went in and got his clearance.) When I went out, there were two or three jeeps parked around the airplane with machine guns. I got onto the airplane and there were a whole bunch of boxes marked “toy dogs”. And they were all fifteen or eighteen inches long and about eight inches wide. And I think we had four thousand-some pounds of toy dogs. But, when we got our clearance, that’s when you find out how many passengers you have, and we only had one passenger. It was an officer-guard (a military policeman who was a commissioned officer) from General MacArthur’s headquarters, from the GHQ in Tokyo; which was most unusual because they were the unit that was set up to guard MacArthur and the headquarters’ buildings in Tokyo. So it was most unusual to see them out in the field like that. But he was the only passenger. Anyway, we took off on the flight, and that’s when he told us it was money. It was greenbacks. This was when Mao Tse-tung ran Chaing out of China, just before Chaing went to Taiwan. We took out all the greenbacks. I had 75 million dollars of greenbacks on my plane. There was another load the same day of 150 million. We landed in Okinawa, and while we were still on the runway, a jeep came in behind us with a machine gun. And, just before we turned off, a jeep in front of us with a machine gun came up. Back in those days, and I guess it’s still true, the pilot had to sign for the load. You had to sign that you had so much load. So I consider that at one time I had 75 million dollars! I: You could have written a check. P: (Laughs) It was all mine for about eight or ten hours. And, of course, flying over the ocean like that, especially in a two-engine airplane, if you lost one engine or if one engine quit running, the priority was to get the airplane back. You dumped the cargo and tried to save the airplane. So, I said to this young guard, “What’s going to happen if we lose an engine and I have to throw this stuff off?” He said, “I’ll stand back there and take the number of each box. They’re all numbered. I’ll just mark down the boxes and you throw them out.” (Laughs) It’s just paper. I: Any other unusual incidents? P: When we first went to Japan, we went to the north island, Hokkaido, and anyway, letting down through the clouds, our pitot tubes froze up. That’s where you get your air speed indication and your altimeter indication, etc. We were letting down, and as I remember, I had the heaters on; but obviously one of them wasn’t working and they froze up. And I can remember that that caused me some moments of anxiety because you depend on those instruments so much—your airspeed so much when landing. But before we got on the ground, we got into warmer air and it thawed out. I can remember how tickled I was to see the air speed come back and indicate about where it should be. But then you go back to the rpm and the manifold pressure and you know, at a given rpm, a given manifold pressure should give you x miles per hour, so you go to that. P: In 1959, I had a B-52 out in the Pacific. We were out on a special mission. We were on Guam and it was toward the end of November, and on the Philippine Independence Day (their 4th of July), and they always had a big celebration out there in those days; and we had all the American forces fly over. And since we were out there in a B-52 and it was new then, so we got to lead the American forces across Manila. The Philippine Air Force flew over first. We left Guam and flew to the Philippines, (it took us five hours or something like that), and let down in the soup solid and came out. Manila sits right on a big harbor, maybe thirty miles across, and there’s a big spit of land that comes out on the far side. And we let down to this spit and came across the bay there. We went across fairly low and quite fast and, of course, the B-52 makes a tremendous noise down at that altitude. So we came across and I can remember seeing thousands of people lined up along the runway. I had the three-star general who rode with me in the jump seat, who thought it was great. It was the first time he’d been in a B-52. I: You were in the Strategic Air Command. How was that duty? P: We were the only ones with the atomic capability. It was the only force, of all our forces, that had that capability. So, much of our work was done in that area. Friends of ours in other commands—Air Defense and Materiel—made fun of us because we worked harder, we worked longer. We always had a closed base where civilians couldn’t go on base. A lot of training bases let civilians just drive on and off any time they wanted. But we always had a closed base—where it took a pass to get on base, and it took a very special pass to get on out to the airplanes; and you always had armed guards at the airplanes. We worked a lot of weekends, but that was where the promotions were. You got promoted faster in SAC. You had the possibility of getting promoted faster there, anyway. So it had its compensations. I: How long did it take you to move up? 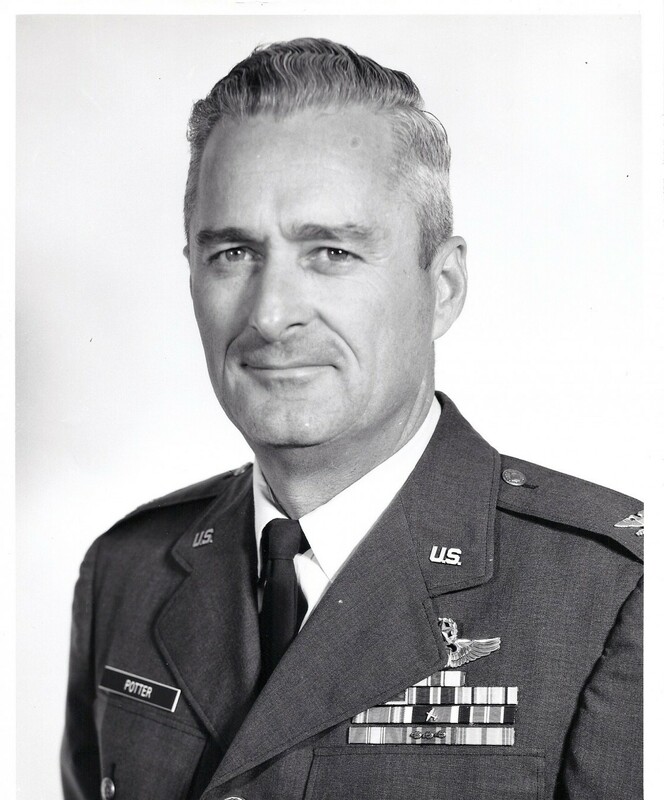 P: I was a Captain in 1958 and a Major in 1959, then a Lieutenant Colonel in 1960, which is really unusual. I: Was being in SAC difficult psychologically? P: We would lose a few who didn’t want to put up with it. We were separated from wives. And some of the wives wouldn’t put up with it. So it took its psychological toll. It was a hard life. I: Were you on alert during the Cuban Missile Crisis? P: Yes, we were on alert most of that time. It was hard because you never knew what was going to happen. But the way I understand it, I think we were closer to going to war then than we’ve ever been. From noon to evening any day, that could have gone from naughty to real naughty. I: How stressful was it? P: I didn’t miss any meals. But because of it, you always ate the meal because you weren’t sure you were going to be there for the next meal. I don’t think the general public was ever aware of how close we came to going to war. And, it would have been a nuclear war. I: What was it like when you first went in the military—any old, fond memories? P: (Laughs) A lot of marching. We’d march down to the training field, then march back. So pretty soon, they needed a bugler. I had played trumpet in the high school band. I didn’t know the calls, but I volunteered and became the bugler. Then, when we trained, I’d ride in the truck and the rest of them would have to march. You know the old story about ‘don’t volunteer for anything’, but I didn’t do that. I either volunteered or worked my way onto the honor council. We took disciplinary action over such things as over-sleeping or not making your bed. I had two or three jobs like that. I figured it was better to make yourself more useful than the ‘average bear’, and I kind of followed that throughout my career. It paid off!